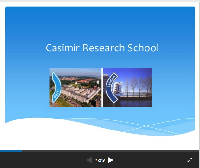 Study: Casimir Pre-PhD track Delft. Currently: PhD student in the group of Herre van der Zant at TU Delft. "Casimir offers various courses that help me to develop a broader set of skills, which are not only applicable during, but also after the PhD."